Happy birthday, pattyfeidt! I hope you have/had a splendid day! 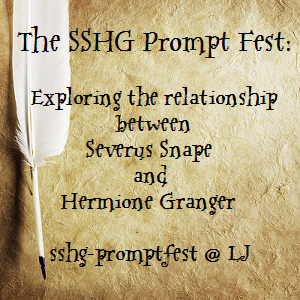 Prompt collection is now open at the sshg_promptfest! Prompt collection at the sshg_promptfest begins on 1 March! Happy birthday, fairyniamh! I hope you had a fabulous day, m'dear! Happy birthday, teryarel! I hope you have a lovely day! I wrote a drabble to celebrate the fact that prompt collection for the next run of the sshg_promptfest begins on March first! A Naughty Page (G; Severus/Hermione; 100 words): Research is its own reward. American wizards had their flaws, but suffering from a lack of self-confidence with regard to witches was not one of them. Salem wizards did not pine; they acted, and Severus had decided to take a page from their book. "I grow weary of studying the text, Professor Granger," he told her, after a pleasantly constrictive evening of research. "I should like to put some of these rituals into practice." "Whichever ones best suit you, Hermione." Flushing, she hoarsely instructed, "Turn to p—page one hundred sixty-nine." "Ah, a naughty page, indeed. How very gratifying." Distant Relations (G; Severus, Eileen, others; 2408 words): Severus learns that house-elves never do anything by halves. A Relative Feast (G; Severus, Tobias, Eileen, Lily; 1195 words): Severus is hungry for more than affection. The Casting (PG-13; Eileen, others; 1561 words): Eileen affects a desperate, runic casting and only later takes the time to reflect upon her actions. Throwing Salt (PG; Severus, others; 3000 words): Severus is not as alone as he thinks he is, no matter how lonely he may be. Warning (highlight to view): For attempted murder and violence. Author's Note: Written for the 2019 run of snapecase. Thank you, Shog, for beta'ing for me. The 2019 run of snapecase concludes! snapecase continues with Fifty (G): Today is Severus Snape's fiftieth birthday. Will it be a good day? snapecase continues with Thirty-eight (G): Today is Severus Snape's thirty-eighth birthday. Will it be a good day? snapecase continues with Twenty-two (G): Today is Severus Snape's twenty-second birthday. Will it be a good day?